Abstract: The release of the Intel i865 'Springdale' chipset comes today, and Intel has released no fewer than three flavours (i865P/G/PE) to choose from. With the release of the i865 Springdale and i875 Canterwood chipsets from Intel, the final stake has been driven into Rambus' coffin. It seems that even the almighty Intel can buckle under pressure from consumers eventually! For Intel anyway, 2002 was the year of the i845 chipsets. The chip maker released a total of eight variants on the original SDRAM supporting i845 chipset. Those iterations include the bandwidth-starving i845, the i845D which allowed the Pentium 4 to use DDR memory, the i845E/G which introduced the 533 MHz FSB, and the i845PE/GE which brought DDR333 support to the table. Lesser known i845's included the i845GL and i845GV which were both low cost P4 chipsets with integrated 'Intel Extreme' video. As great and reliable as the i845D and onward were, they could never quench the Pentium 4 processors' (not even a 400 MHz model!) thirst for memory bandwidth. In fact, it could be said that the changes to the i845 series were more of an evolutionary path, but late last year when Intel released the E7205 (Granite Bay) chipset the revolution started. While the E7205 was officially a workstation chipset, Intel had finally offered up a dual channel DDR based chipset that could provide the Pentium 4 with sufficient bandwidth! The seeds were sown, and it was only a matter of time before Intel would bring dual channel DDR to the masses. Intel's i865 Sprindale dual channel DDR chipet. In April of this year Intel released the i875P 'Canterwood' chipset which officially replaced the i850E as the top of the line desktop northbridge. 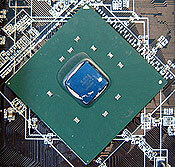 Chipzilla said "bu-by" to RDRAM in the high-end Pentium 4 desktop world, but interestingly enough released nothing new for mainstream desktop computers to work with. The i845PE would have to last out a little while longer until i865 Springdale was ready. The release of the Intel i865 'Springdale' chipset comes today, and Intel has released no fewer than three flavours (i865P/G/PE) to choose from. The i865PE Sprindale we are examining in this review offers a whole new world of features for the average user to revel in. First and foremost on that list is Dual Channel DDR, but let's not forget natively supported Serial ATA via the ICH5 southbridge (RAID 0 via the ICH5R only) as well. Armed with Intel's i865PE northbridge and ICH5R southbridge, the AOpen AX4SPE Max offers a formidable set of features that should make this review rather interesting... so pay close attention as we begin! 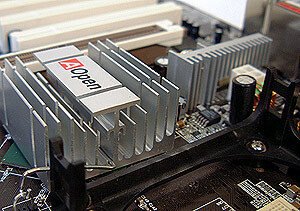 The AOpen AX4SPE Max supports any 'Northwood' 400/533/800 MHz FSB based Pentium 4 processor and can hold up to a maximum of 4GB of paired PC1600/2100/2700/3200 DDR RAM. This is a dual channel DDR board, so for the best performance results it is recommended that the blue 184-pin DDR sockets be populated with identical DDR modules first, and then the same thing done with the black DDR sockets. The ATX-sized board includes four Serial ATA ports, two of which support Serial ATA RAID 0 & 1, and RAID 0 thanks to the Silicon Image SataLink and ICH5R (FW82801ER) southbridge respectively. Additionally, we find six onboard USB 2.0 ports (two on a riser), two IEEE 1394 Firewire ports, 5.1 audio, Gigabit LAN, dual BIOS's and no less than three fan headers to choose from. 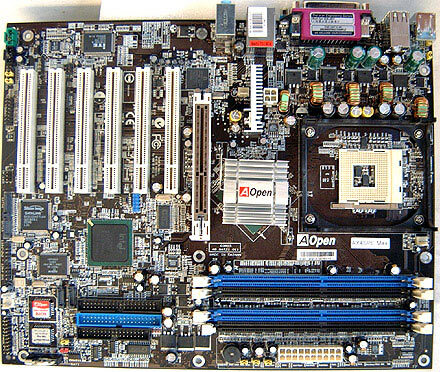 We usually do not comment on software bundles, but AOpen deserves a pat on the back for including Norton Antivirus 2003 with this motherboard. AOpen have been using a black coloured PCB for their motherboards the last little while, and I must say it looks pretty nice. The general layout of the board is also pretty good too; the main ATX power connector is in a great location just to the right of the DDR DIMM slots and the two IDE connectors are located just under the four DIMM's. It's nice that AOpen places most of the connectors on the bottom of the motherboard (Serial ATA, IEEE 1394, game port, etc), because once the three brackets which are included in the box are connected up there are a lot of wires floating around. With these wires kept to the base of the motherboard they are much less likely to get in the way of other components. Despite all the integrated peripherals, the AX4SPE Max still includes an amazing six PCI slots! That should be plenty if you're looking to upgrade your system further. An 1.5V 8X AGP socket is also included. AOpen place a fairly large passive heatsink on the i865PE Northbridge, and during our testing it seemed to handle the job of cooling the i865PE well. The ATX 12V Auxiliary connector is situated adjacent to the CPU socket, but we understand that's the best way to get stable voltages to the processor. While the ICH5R southbridge includes two Serial ATA channels as well as RAID 0, AOpen has gone out of their way to include another two Serial ATA channels (thanks to the Silicon Image controller) which can be used in RAID 0 and 1. The board is fairly well labeled, but could use a bit more identification around the front panel connectors - as it is you'll have to reference the the quick start guide AOpen include to connect the wires up properly. I dislike the position of the CMOS battery as it is standing up on its edge near the bottom corner of the motherboard. It makes an easy target for getting clipped off by overzealous users.